Supports SED, Low $/TB – Rugged 1U Tray. Lightweight, 2U Rugged Canister Disk Array with 20 Disks. For Airborn, Shipboard and Ground Mobile Data Recorder. Rugged, removable canister RAID Series enables rapid removal of large data stores from reconnaissance and surveillance missions. 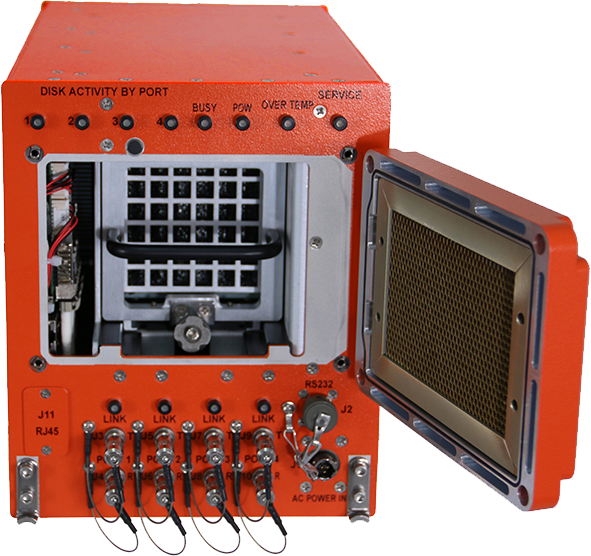 The RR1P and RR2P Pluggable Canister RAID Disk Arrays lets military personnel take critical surveillance and instrument data and move it from a vehicle to a ground station in under two minutes. Joe Sanzio, Chief Technology Officer, Winchester Systems Inc.
Winchester Systems provides purpose-built, dependable, high-performance server and storage systems—and expertise—to prime contractors, federal and military clients. The experts in COTS-Rugged and Mil-Rugged systems at Winchester Systems collaborate with each client’s integration team to tailor a solution, including rugged storage and servers, to best fit the environmental and workload requirements.